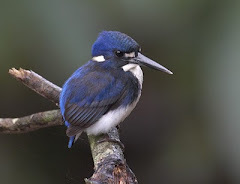 A great time of year for birding in Daintree. Some nice rain last week, then clear and dry again now. Just enough rain to top up the pond at Red Mill House so the Little Kingfisher and Azure Kingfisher both have space to feed. Nesting activity is in full force with the Australian Figbird trying to dominate the yard - they are certainly the most common bird each day. A huge Milky Pine in the yard has several figbirds nesting, plus a Yellow Oriole and Helmeted Friarbird on nests. Probably more that we don't see, also! Much disputing of territories going on! The strangler figs are in full fruit, so there is plenty of food close by. The Black Butcherbird (not our favourite because they are such aggressive predators and we don't have a lot of space) have also been nesting in the Damson Plum. I know they have to feed their babies, but I do wish they wouldn't pick off our lovely frogs all the time. It is no wonder that our frogs like to hang out inside the house during the day, rather than in the garden. Just don't tell the Health Inspector!! Other sightings locally include Pacific Baza along Stewart Creek Rd, Double-eyed Fig-Parrot, Cicadabird, Great-billed Heron and Papuan Frogmouth (also nesting). 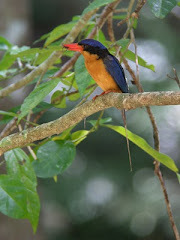 Still hanging out for that first call of the Buff-breasted Paradise Kingfisher.